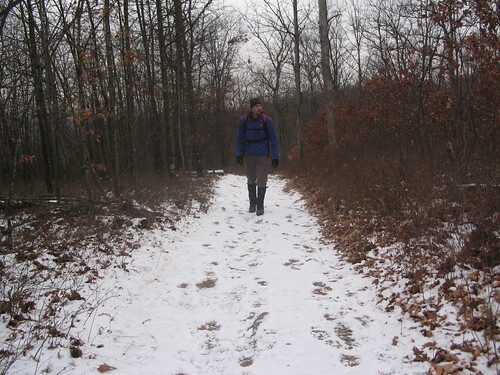 Few aspects of winter hiking contribute more to the enjoyment of the day or night than keeping your hands warm. If your fingers or palms are numb, chances are the numbness affects your entire body and mindset. Are you really having fun if your hands feel as if they’ve plunged into a bucket of ice for four hours? Probably not. 1.) During a hike, I want my hands to have full movement as well as warmth so I can grip trekker poles and operate my camera or GPS. I don’t want cumbersome gloves at this moment. As long as my arms pump to help my body walk along a ridgeline or ascend a steep slope, blood is flowing to my hands, so I don’t usually need thick mittens or gloves insulated with down … unless the temperatures have plummeted so far and/or precipitation is falling. That warrants the need for more insulation or a waterproof covering. Generally, though, I hike with a glove made of a flexible material called Polartec, which is a blend of polyester and spandex. It’s lightweight and conforms to my hand so I can easily grip the handles on my trekker poles, zip up the softshell or use my GPS. If I start to notice the glove does not provide enough warmth, I’ll add a small liner. 2.) Five backpackers including myself stopped along the Red X Trail in Wyoming State Forest, PA, during a frigid February 2005 trip, and I noticed one of my companions immediately begin swinging his arms like a great eagle methodically flapping its wings. I tried it. Looked strange, but I could feel blood pouring into my hands. And I didn’t get cold. The idea here is to get warm blood into your hands to keep them from becoming numb with coldness. Do this motion slowly, and don’t over exert yourself. You don’t want to sweat and open up the chances for hypothermia. Try this to get warmth to your hands. 3.) When I’m in camp, then I turn to thicker gloves. I’m not moving as much compared to hiking, so I get colder faster. I keep on the layers I mentioned in item No. 1 while covering over with a mitten. Why a mitten? I learned from experience that gloves with fingers keep those fingers isolated from one another. Why do this when bunching them up does a better job of keeping your fingers warm? A mitten puts four fingers together, and each builds upon the others warmth. If each individual finger resides in its own compartment, the finger won’t retain its warmth as well. 4.) Yeah, these are necessary. 5.) As strange as this sounds, should you find yourself unable to warm up your hands, fold them into your crotch. Your crotch is one of the warmest parts of your body, and keeping your hands there will help warm them up.